Posted By:Unknown | At:8:53 AM Be the first to comment! (NY Daily) -- The tables have turned. 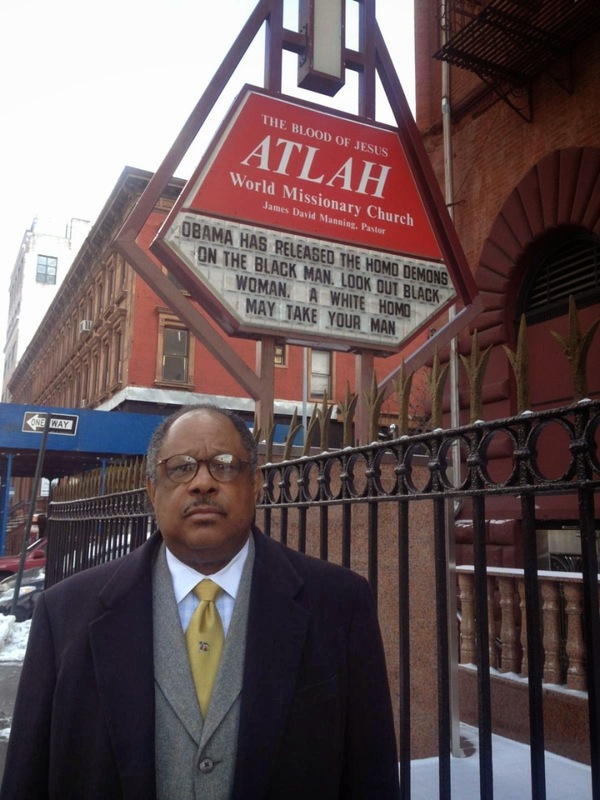 Police are investigating the vandalism of the inflammatory sign at ATLAH World Missionary Church in Harlem over the weekend as a hate crime. The unlikely situation stands to paint the church’s controversial pastor, James David Manning, who frequently adorned his marquee with blatantly vicious messages, in a sympathetic light. The pastor and his billboards are protected under the First Amendment, though, the New York Civil Liberties Union has said. The fast-moving culprit climbed over the fence of the church, on W. 123rd St. near Lenox Ave., and spray-painted “God Is Gay” on both sides of the sign. The at-large suspect, who was captured on surveillance video early Saturday, also removed the letters of a homophobic message that sparked outrage in the Harlem and LGBT communities. Manning applauded the news that the vandalism of his sign was being investigated by the NYPD Hate Crimes Task Force.